This is an interesting book because it’s written by enterprise-level Search Engine Marketing (SEM) geniuses. They eat big data for breakfast every day. I’m tempted to start the review with ‘if you haven’t read this book, stop calling yourself a marketer’ but the content applies to a wider audience, so I’d have to amend my opening to: read this book now. Yes, inbound marketing and content marketing can be effective when you’re doing them correctly, and if you are a busy executive who is unfamiliar with these concepts and don’t do these things on a regular basis like I do then this book can help you quite a bit. Packed with actionable advice and reflecting the decades of experience of its two authors, Outside-In Marketing should be required reading for any digital marketer. Both of the authors are seasoned marketers, and seasoned digital experts. They explain all the terms and buzzwords in a language that you and I can understand. Outside-In Marketing by @James_Mathewson & @MikeMoran is a great complement to @halvorson‘s foundational Content Strategy for the Web. You can tell a good biz book by how many pages get dog-eared and highlighted! Kudos, James Mathewson and Mike Moran! [A]n insightful, pragmatic guide that delivers on its subtitle and is a must-read for anyone involved in marketing in any capacity. Click the buttons above for discounted prices on paperback and Kindle versions! Watch the video of the Biznology webinar by James Mathewson about some of the techniques mentioned in the book. You can read the first chapter free here. Listen to an interview with me about the book on FIR B2B. Here is another FIR B2B interview with James Mathewson. Marketing has always been about “me”: my brand, my product, my company. But “inside-out” marketing no longer works: your customers simply won’t tolerate it anymore. You need to transform your marketing to “outside in.” Every message you deliver must engage, fascinate, and motivate the right audiences, because you start and finish with what they already care about. Your marketing itself must provide value to customers — whether they buy today, next month, or far into the future. How do you know what messages will do that? How do you get those messages past tough new digital gatekeepers? You start here, with Outside-In Marketing. Content marketing is all the rage right now—representing everything from the future of advertising to the death of journalism—but Mathewson and Moran move beyond the hype and offer practical solutions to take advantage, effectively and sustainably, of the deluge of data that businesses can benefit from. If you employ Inbound Marketing, and measure the way Mathewson and Moran tell you to, you should be well ahead of competition. You will probably want to read it several times over, combined with discussions with both your marketing- and IT-departments. Both of these must be engaged in order to implement the right actions, and to get correct measurements from the same actions. Packed with actionable advice and reflecting the decades of experience of its two authors, Outside-In Marketing should be required reading for any digital marketer. Although the term “big data” on the cover may scare away some people, this is not a bits-and-bytes book. The authors focus on data that most markters are already gathering or have available to them, but probably never use. I’m tempted to start the review with “if you haven’t read this book, stop calling yourself a marketer” but the content applies to a wider audience, so I’d have to amend my opening to: read this book now. It’s one of those rare books that has more highlighted content than not, and I’m contemplating another read-through just to catch any bits I’ve missed. The concepts that Mathewson puts forward will be eye-opening for most marketers, and he backs them up with real-life examples. The idea of leading with your content is nothing new, but it’s framed in a contemporary context, taking into account the audiences that brands deal with today. It’s definitely not a Mad Men world any more, and Mathewson explains in straightforward ways how to catch up and keep up in a fast-moving world, combining marketing, search, analytics, and big data to meet your organisational goals. 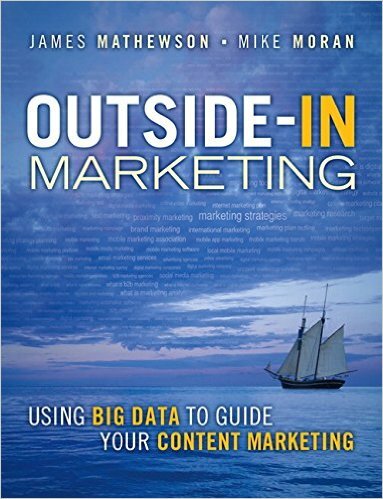 In Outside-In Marketing: Using Big Data to Guide Your Content Marketing, Mathewson and Moran have figured out how to make search marketing (SEM), content marketing, search engine optimization (SEO),and inbound marketing actually work for you by taking the guesswork and opinion out of the mix and relying, instead, on A/B tests, data-tracking, and strong analysis of the data you’re already collecting to win at search, to win at content, and to win at business. The book is thin, essential, and maybe should even be proprietary. There’s no BS but don’t second guess them or assume that you, too, can’t leverage the sort of tools and strategies that Mike and James do.